"Brilliant (and tiny) bit of kit"
"An excellent piece of kit I'm very pleased with It"
"A perfect "live" yesterday in Greece, using Smooth Hound Innovations transceiver. Thanks again Chris!!! Looks like the perfect mate for my violin pickup!!!" "Very happy with my SmoothHound unit. I've done probably 25 gigs with it now in all sorts of venues and it's absolutely great. Not had a single "issue" at all (touch wood) and I feel more confident in using it than any other wireless I've owned." "Fantastic customer support. Item is fabulous. Thanks a million!" "Besides the size, the range of the smoothhound is better, the battery life is several times longer and the construction is better." "Works so much better than any other I have had; and it is tweakable! Well done"
"Very pleased to report that this arrived safely yesterday and I'm delighted with it. In fact, I'll be ordering another unit in the not-too-distant future, I think!" "Very honest, fast and reliable service. Much appreciated! And not to mention, an amazing wireless system! Simple, reliable and powerful." "It’s great - it’s completely reliable and couldn’t be simpler. Whether you’re in a studio or domestic environment, anything that reduces the number of cables lying around can only be a good thing." "Great system! Amazing range, fidelity and simplicity in a ridiculously small form factor! Beats the pants off the ***** and ****** systems I've used and much less expensive. 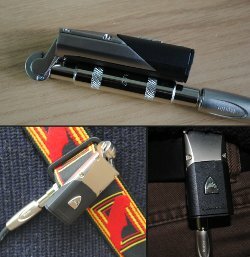 No clunky strap pocket to struggle with, just unstick and plug into the next instrument. Looking forward to being able to get a separate transmitter so I can easily change instruments on stage. Keep up the great work!" "I think I've got some magic rechargeable batteries in mine right now - current pair have managed ~10 hours of practise since putting them in freshly charged and still showing 2 bars left. No paranoia of running out mid-gig if they go in fully charged!" "A nifty bit of kit, both in looks and ..."
"Excellent in every respect. This product deserves the very positive comments it receives whenever it is reviewed. It is well made and performs superbly. Also, the delivery deserves 5 stars too, arriving a full 4 days before its earliest forecast! Brilliant." "Hi. I bought your wireless guitar system today at the Skipton Guitar fair. I've spent all afternoon trying it out and I absolutely love it. You have come up with a beautiful little design and I shall be recommending it to anyone who sits still long enough! Great value for a lovely piece of kit. Many thanks and all the best." "Got it. Love it. Thanks." "I had concerns over alternatives. So glad I went with this option." "I love this system, cheers!" "Gigged with mine last weekend, several bands playing throughout the day, no interference issues or battery problems, output still sounded like me, very happy bunny." "All in all I am very very happy with it and can recommend it to the members." The Classic wireless system is perfect for any instrument with a 1/4 inch jack socket. People are enjoying Wireless Freedom with electric guitars, acoustic guitars, bass guitars, violins, flutes, keyboards, accordions ... all with Uncompromised Tone. The Classic's ultra low harmonic distortion ensures the tone of your instrument is preserved. Low latency and impressive dynamic range mean you never lose detail, timbre or immediacy. It's near impossible to hear the difference betweeen a Smooth Hound wireless system and a cable. The transmitter's adjustable jack hinge is made from hand polished die-cast zinc parts and is designed to fit all instrument socket positions. The Receiver is made from robust painted aluminium.